Scorpio Rising gives you a strong physique and tremendous physical stamina. Far more stubborn than you seem on the surface, you assiduously stick to your goals as long as there is a chance they will be achieved. It is difficult to convince you to change your mind once a decision has been made. Your emotional vulnerability remains concealed unless your natal sun or moon happens to be in Cancer or Pisces. You are are friendly and while you can be rather quiet, you have quite a gregarious personality and don't mind being in the spotlight. It is highly unlikely that you, as a Scorpio rising, have that sinister or mysterious personality which popular literature tends to associate with the sign of Scorpio, but you are a keen observer and a shrewd speculator. 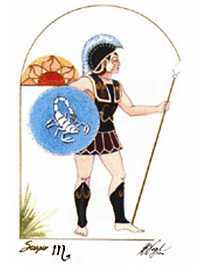 Scorpio is ruled by Mars, the warrior, and Pluto, the transformer. Both planetary influences may be seen in your personality. Ambitious, energetic, you seek activities that are economically rewarding, as well as mentally or physically challenging. The jealousy associated with Mars and Pluto is minimal unless other factors in the chart support such a trait (say Scorpio, Aries or Capricorn Sun). You possess the cleverness and mechanical ability associated with Mars, as well as the innate resourcefulness associated with Pluto.